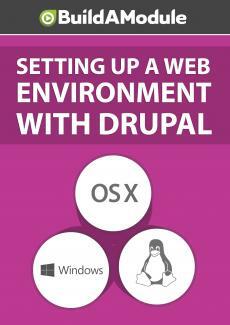 Now that we know how to set up stand-alone web environments with XAMPP, we walk through manually installing Drupal in one of these environments. Now as one final step let's install Drupal in this directory. To do this we'll need to download Drupal and unpack it into this folder, and we'll also need to create a database for Drupal to use. So first let's download Drupal. I'm going to open up a new tab in the browser and I'm going to type download Drupal. We'll click on the topmost option, which is Drupal dot org slash download, and we'll click download Drupal 8, the specific version that you want or that you have available to you might be different, but the process here will be nearly identical. I'm going to go ahead and click download core 8. 2 and we'll download the tarball here by clicking it. I'll click save file. Now let's navigate to the folder and I'll expand this by double clicking, and I'll expand the Drupal folder here, and now in this window I'm going to navigate back to our Drupal 2 directory. So I'll go to computer, opt, lamp, apps, Drupal 2, we'll delete this index dot PHP file, and I'm going to select all the files here and drag them over to copy them over. And so now we have our files. Next we need a database. So again we can go to our XAMPP dashboard by going to the browser and just typing in local host. And we can get to PHP my admin by clicking the upper-right link here. Over in the left-hand side we have a list of our databases. We just click new and let's call this Drupal 2, and let's click create. Okay, so at this point we can go back to our Drupal 2 site and refresh, and we'll get the Drupal installation screen.